Varieties of Crozy Cannas raised in France by Mr. A Crozy. Many of these old plants have been lost over the years while some have possible been renamed. 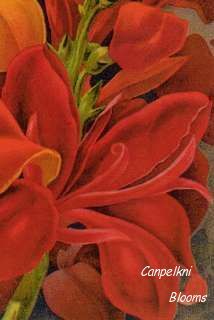 Here are some of named cannas he introduced into garden around the world. Comte de Bouchaud a most beautiful new introduction of another of the crozy cannas from Mons. Crozy -The Canna King. 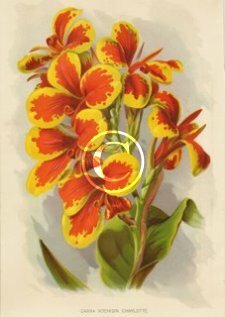 It will give you an idea of it quality when he says he considers it to be the finest spotted cannas in cultivation. The flowers are of enormous dimensions with the petals gracefully overlapping each other thus making each individual flower appear almost round. Spikes on Comte de Bouchaud are borne in profusion and covered very closely with dozens of perfect flowers which are of the richest yellow and evenly spotted throughout with bright crimson. Francois Crozy pictured above, with plants of vigorous growth and foliage green. The spikes are numerous with large petals being roundish. Color is a beautiful bright vivid orange edged with bright yellow gold, very good for bedding and garden it is equal to Madame Crozy style of growth but Francois Crozy is more dwarf. Won a Bronze Medal award at the World’s Fair 1893 in Chicago. Francois Crozy when offered for sale in 1892 was priced 40c each. Professor David is a good variety but narrower in petal than Mad Crozy but is a very abundant bloomer with yellow flowers blotched with chocolate or dark brown. Maurice Rivoire a remarkably vigorous grower with magnificent leaves of great size and being purplish bronze in color. With very large deep red flowers resembling those of a Gladiolus. This excellent variety was considered by M. Crozy in 1889 to be his greatest novelty at that time. In 1892 the new Maurice Rivoire was described as growing to three and a half feet tall and offered for sale through Vaughan’s Seed Store of Chicago in the USA at a price of 40c each. Alphonse Bouvier the grandest canna for bedding out of door introduced up to this time. It is a very luxuriant grower growing considerable taller the Md Crozy throwing up flower stems more freely than that variety. I good ground and under good cultivation the plant will grow eight feet, it begins to bloom very early and is one continuous mass of crimson the entire season. The tips of the shoots are surmounted by immense clusters of bright crimson flowers of the very largest size and nothing can exceed their brilliancy. It has a peculiar habit of drooping the flower cluster a trifle of the second flowering shoot begins to push above the first and the shoots flower two three or more times one after the other, a large plant in bloom sometimes having on it as many as thirty or forty of these large brilliant clusters of flowers. Grande is the only word that describes this variety. For general bedding purposes it surpasses Md Crozy and other crozy cannas. Upon being tried this past season this was questioned but trial has convinced the most skeptical that no other variety approached it for grander and effectiveness for when embedded in masses. As a pot plant for greenhouse cultivation it is not so desirable on account of its taller growth. Captain P. de Suzzonii with flowers almost as large as Madame Crozy, it is one of the best yellow garden cannas introduced so far. With large spikes that are slightly mottled with a scarlet brown. 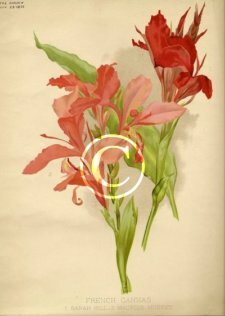 The scarlet brown markings are such that instead of detracting as is usual with most yellow cannas that have been so marked, that instead of detracting it intensifies the brilliancy of the yellow. Captain P. de Suzzonii has a distinct habit of growth, a tall and bold grower with flowers well above the leaves which are very appealing like the banana. Introduced into America in 1892 and Awarded a Bronze Medal at the World’s Fair 1893 in Chicago and offered for sale in 1893 for 30 cents each. 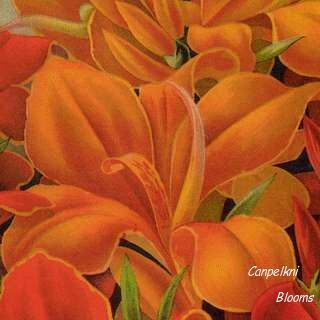 Beautiful Prints of Canna Flowers for sale featuring heirloom cannas from around the world that have been enhanced and restored by me. 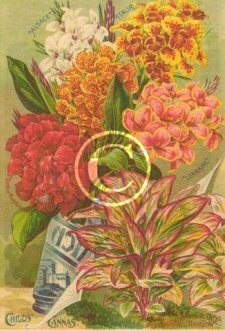 Prints are from my personal collection that I have sourced over the years of collecting original old vintage related works from Garden Seed Catalogues, lithographs, chromos, and plate prints etc. They have been reproduced on quality A4 photo paper. 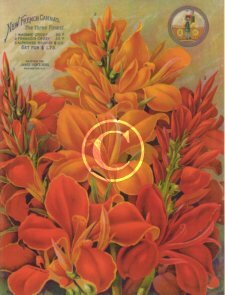 Watermark will not be on your prints of canna flowers. Photo print of New French Cannas The Three Finest. Featuring Madame Crozy, Francois Crozy and Alphonse Bouvier, painted for James Vick's Sons 1892. 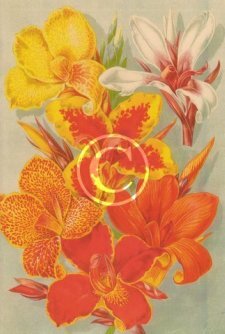 Photo print of Mixed Cannas from the 1890s. Photo print from Childs Grand Flowering Cannas, featuring Alsace, Italia, Lorraine, Duke of Marlborough and the New Variegated Foliage Canna Rainbow. 1890s Litho produced for John Lewis Childs. 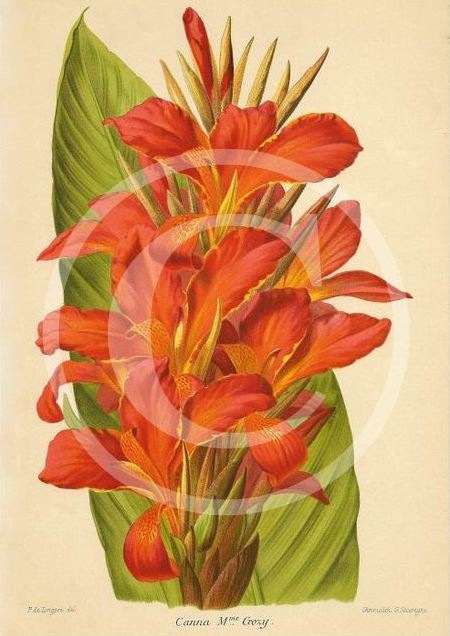 Photo print of French Cannas from 1895, featuring Sarah Hill and Maurice Mussey. Photo print of Canna Koenigin Charlotte, from 1910.